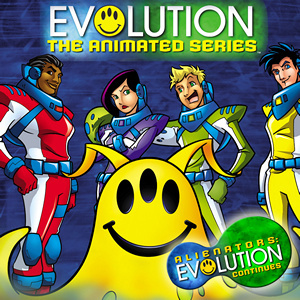 Alienators: Evolution Continues (known as Evolution: the Animated Series in the United Kingdom) is an American animated comic science fiction television series based on the 2001 film Evolution. Created by Louis Gassin, the series is composed by 26 episodes of half an hour each; it is produced by DIC Entertainment L.P. in association with The Montecito Picture Company, DreamWorks Animation, DreamWorks SKG and Columbia TriStar Television. Although the Evolution intellectual property was owned by DreamWorks SKG (and is now the property of Paramount Pictures via its purchase of the studio's pre-2006 live action back catalog), the series itself is now owned by DHX Media. The series was the basis for a Game Boy Advance game, that was developed by Digital Eclipse and published by Activision. Mill Creek Entertainment announced the complete series on DVD. As with the film, the premise of the series is that a meteor carrying organisms that evolve at a very quick rate crashes into the Arizona Desert; single-celled alien organisms on this meteor quickly evolve into monstrous creatures, dubbed the "Genus". A team of scientists, the Alienators, must eliminate all these creatures before they destroy all life on Earth. Follows up to the Ivan Reitman science fiction film, Evolution. The characters, Ira Kane, Harry Block, Lucy Mai, and Wayne Green must study all these extraterrestrial lifeforms and find a way to defeat them all. The "Genus" is led by a "humanoid manifestation" named Scopes. Scientist Ira Kane – A biologist fascinated by scientific discoveries and breakthroughs. His scientific knowledge, along with his excitement and passion about the theory of quick evolution, helps him lead the team in eliminating the Genus. Scientist Harry Block – A coach who always keeps up on game scores, etc., and loves coaching the women's team. His strategies help the team to victory. Lt. Lucy Mai – A tough and aggressive lieutenant trained by a Special Forces team called The Blue Berets. She believes everything should be done by the book, and if it is not explained in the book, they should avoid it. Teenage "wannabe fireman" Wayne Grey (who's been renamed Wayne Green) – A 17-year-old firefighter-in-training. Being the first human infected with alien DNA, he develops a "sympathetic mutation", causing him to mutate parallel to any Genus strains encountered. Scientist Allison Reed has no direct work with the alienators, but is mentioned a few times, no retaining a relationship with Ira like in the movie. General Russell Woodman is the pompous windbag in charge of giving the alienators missions. G.A.S.S.I.E. : Stands for "Genetically Altered Symbiotic Stasis in Evolution", and is the team's pet. It was an alien cell originally neutralized by Ira. It evolved into Gassie, a slime creature that yips and behaves like a dog, who can detect and track other Genus creatures. When Gassie detects the Genus, he quivers and emits a foul odor. Scopes is the Genus' leader: Super intelligent and intent on taking over the universe. Though he occasionally evolves into various creatures, his most common form is as an alien humanoid octopoid. His name is a reference to the Scopes trial. The Alienators take down a target at The Glen Canyon dam. However, this results in its DNA mixing with the water supply, causing the populace to mutate into human-Genus creatures.